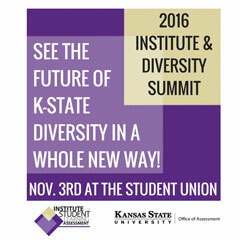 The 2016 Institute for Student Learning Assessment/Diversity Summit will be from 8 a.m. to 5 p.m. Nov. 3 at the K-State Student Union. The event provides opportunities for students, faculty and staff to learn about research and teaching practices that relate to diversity learning outcomes. Participants will hear how faculty across a variety of disciplines teach and assess diversity, how students and alumni view diversity education and how students and faculty are approaching diversity topics in research. The event includes a faculty panel on teaching diversity, a student panel on diversity perspectives and a diversity research forum. View all events on the full PDF schedule. Faculty, staff and students are invited to attend and learn about the future of diversity at K-State. The summit is sponsored by the Office of Diversity, Office of Assessment, Teaching and Learning Center, Office of the Vice President for Research, and K-State Libraries' Dow Center for Multicultural and Community Studies.